Bio: Jeanna is a half alien (Bakarii)/half human teen who grew up with her adoptive father after her parents were killed by bandits. She grew up very poor, with her father barely making enough money bounty hunting to pay the bills. Wanting to help Jeanna eventually began to help her father bounty hunt, he is not to keen on her bounty hunting but he know she just wants to help. She will usually only hunt low level bounty's, but when given the chance she jumps on catching higher level criminals. Personality: Jeanna is the kind of person who sees talk as cheep, and because of this she very rarely will talk with people. Because of this Jeanna primarily expressions herself through expressions and body language. Most of the time she is very calm, and a bit oblivious to situations. However when her adrenaline spikes, be it from excitement, anger or fear, she becomes very aggressive and if she doesn't calm down she can become excessively violent. Her attitude is that of a spoiled kid, she expects things to go her way and when they don't she throws a fit. But despite everything Jeanna values her family more than anything, and would do whatever it takes to keep them safe. Powers: Jeanna has a nearly impenetrable skin and a strong skeletal structure. She has super strength and enhanced speed. Her strength coupled with her light weight allows her to jump to incredible heights and immeasurable distances. She also has the ability to produce lazer beams with her mouth. Random Notes: Jeanna has a crazy sweet tooth, and is almost always eating a lollipop in an attempt to mimic her father who smokes. 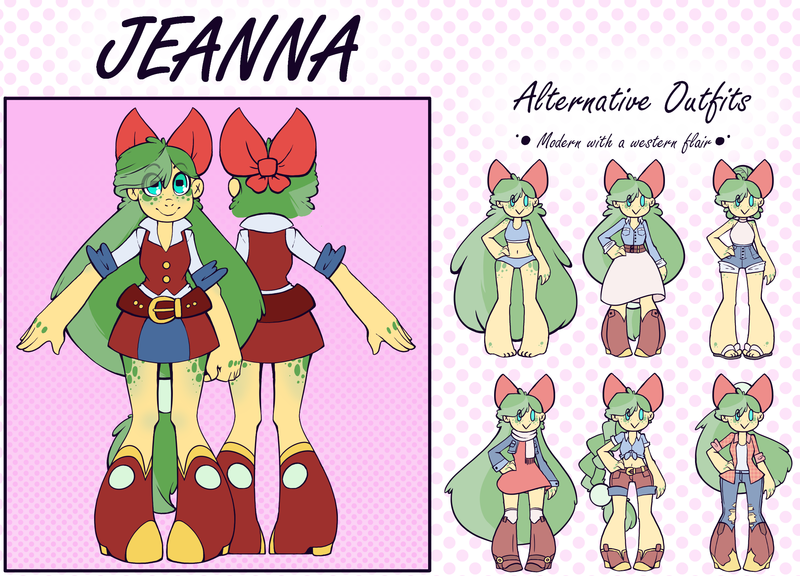 Jenna does not have scaled skin, it is normal human skin and the green markings are freckles and birth marks.